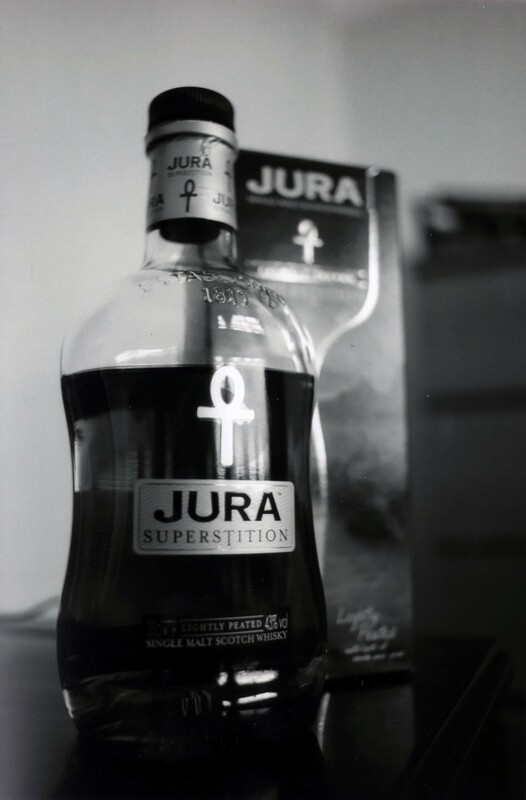 My favourite whisky, although admittedly not my favourite expression of the whisky from the Jura Distillery. This was taken on my Nikon FM with 28mm lens on Ilford FP4 125 ISO film at f2.8 1/30th sec. Firstly the bottle is lovely and focused, as it should be, with a nice drop off in focus and pleasing bokeh as the shot moves into the background, the box being blurred but not totally unreadable and then the further background of the desk being a mish mash of grey tones, exactly the kind of thing you want from bokeh. I love the colours in this image, the rich darkness of the liquid in the bottle, the clear glass where the bottle has been half drunk, the label and lettering, even from a monochrome image you can tell it’s gold, and the grey tones throughout the background, all contrasted wonderfully as they move from dark to light. The reflections on the bottle are nice as well, light bouncing at one point and at another a ghostly image of the window on the other side of the room. And finally the effect of 3D I feel is well expressed through not just the items in the shot and the shape of the bottle but the raised lettering in the glass itself, the bottle almost leaps out of the image asking you to pick it up and take a dram. In fact I fancy one myself. A nice photo and a fine dram too.